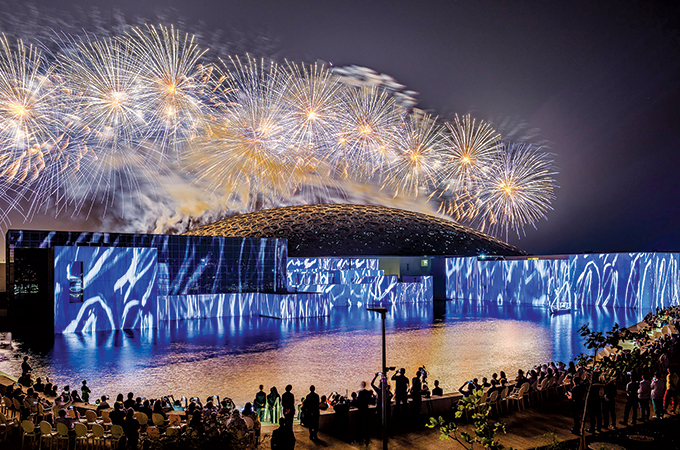 During its opening celebrations, Louvre Abu Dhabi welcomed 30,000 visitors, 227 artists and performers and numerous VIPs and official visits. The museum launched to the public on November 11. To mark the historic occasion, Louvre Abu Dhabi presented four days of public performances, workshops and concerts, including an exceptional audio-visual light show from Groupe F and headline concerts under the museum’s iconic dome from French superstar Matthieu Chedid, known as –M–; Malian singer and dancer Fatoumata Diawara; jazz and world music sensation Ibrahim Maalouf; and Colombian-Caribbean powerhouse Totó La Momposina. In total, the museum presented 25 events by 227 artists across the four days, including choreography by Lucinda Childs and Lemi Ponifasio; traditional Emirati Al Ayaala, Chinese and Dogon parades; a music video montage of found TV footage by Emirati artist Hind Mezaina; and other multicultural music, dance and art performances. Residents, tourists and delegations visited Louvre Abu Dhabi throughout the opening week, exploring its universal collections and architecture for the first time. Around one million people visited Louvre Abu Dhabi’s website during the week, and the museum registered more than 1,100 new members of its Art Club membership programme.